In order to understand if couscous (koos-koos) is healthy, one needs to understand just what denotes a healthy food choice, the definition of healthy food and what nutrients couscous contains. Many times, a healthy food can become unhealthy when it is prepared in an unhealthy manner, such as deep-fried foods or pan fried foods. Good food choices become unhealthy if they contain anything white, such as white flour, sugar, and excess salt. Foods lose their healthiness when a person adds unhealthy food choices. Couscous prepared with grilled or baked chicken or fish is healthy. Couscous served with deep fried chicken is unhealthy. The food pyramid has been the rule of thumb for healthy eating. The pyramid explains what amounts of each food group people need to include in their daily diets. If he or she adheres to the food pyramid every meal, they are sure to get the correct amounts of vitamins and nutrients every day; thus they will be healthier. You must not overcook vegetables and grains or all the nutrients will be destroyed. Couscous must be cooked the proper way. Use food preparation methods such as broiling, baking, grilling, and steaming, so as not to destroy essential vitamins and minerals. Use whole grains and avoid anything white. Use fresh or frozen foods and avoid canned foods because of hidden sodium and sugars. The healthiest foods on the pyramid constitute the base of the pyramid. As you work up the pyramid, the sections become smaller, which means your body requires these foods but in smaller quantities, including fats. Couscous is one food item that many people have not experienced. This food item comes in three different sizes, depending upon the area it comes from. A smaller type of couscous made from grain resembles rice but is considered pasta. Some people think couscous is pasta; others think couscous is a grain; however, couscous is both a pasta and a grain. Couscous is made with semolina flour, which is well-known for its nutritional properties. Often, couscous has a base of whole-wheat flour, which gives it good nutritional value and fiber in the diet. Couscous is a specific cultural dish mainly found in Africa, the Middle East and the Mediterranean areas. Nutritionally speaking, couscous contains healthy essentials such as whole grains and fiber, is good for the body and helps with weight loss. Couscous gives people a feeling of fullness, thus curbing hunger. What makes Couscous such a healthy food? There are many different ways to prepare couscous, including as an ingredient in soups. Use it as a side dish instead of white rice. Mix it with a fresh salad. If a person boils this healthy food choice, it cooks quicker but tends to become starchy and sticky if it is not boiled right. Ideally, couscous is steamed and fluffed up, separating the small grains. The correct preparation of couscous depends on what type of couscous the person is using. The person eating couscous will find it to be a bland food. Some people mix couscous with a favorite food flavor, such as fresh vegetables or meat. If you prepare too much couscous, it is all right to freeze portions. Frozen couscous is fine in the freezer for up to three months. a form of wheat. It can be eaten as a side dish, salad or dessert, and you can use it in place of rice or pasta. Eating couscous provides you with a good source of lean, vegetarian protein. A 1-cup serving of cooked couscous gives you 6 grams of protein, which meets 12 percent of the daily value for the nutrient. Your body relies on dietary protein to support healthy skin, muscles, organs and other body tissues. Choosing lean protein sources helps ensure you’re meeting your daily protein needs without consuming excess fat. A serving of couscous has less than 0.5 grams of fat per serving making it very lean. because it absorbs water and swells in your digestive tract helping you feel full. It also keeps food moving through your body preventing constipation. Your cholesterol level may even benefit from fiber because it binds to cholesterol in the digestive tract and removes it from your body. metabolism of thyroid hormones, protein synthesis and preventing damage from free radicals, according to the Office of Dietary Supplements. One cup of couscous also contains 7 percent of the daily value for the mineral manganese. In conclusion, couscous is a great, healthy food, offering an abundance of nutrients. These nutrients help to keep the body healthy. The key to consuming healthy food choices is the way in which the food is prepared. Add couscous to your diet today and see if you notice a difference in your weight and health. 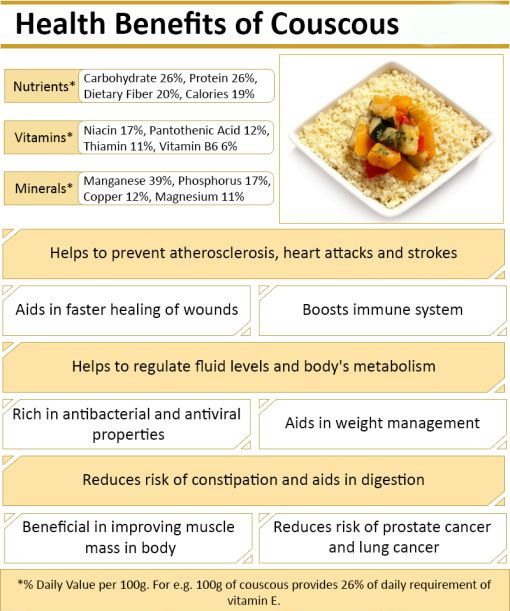 Couscous can be purchased at your favorite supermarket or health food store.